If you have relative permalinks set up in your _config.yml file, then you should receive a page build failure advising you to remove the relative_permalink option from your _config.yml file and replace any relative permalinks in your site with absolute permalinks. permalinks to be absolute to the site root, not the parent folder. 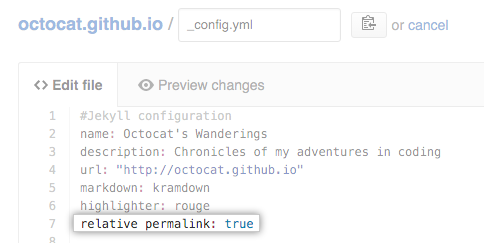 Permalinks are permanent URLs that reference a particular post or page on your GitHub Pages site. Absolute permalinks are URLs that begin with the root of the site. Relative permalinks are modified URLs that begin with parent folder (the folder containing the referenced webpage) instead of the root of the site. For more information, see Jekyll's official documentation on permalinks. GitHub Pages and Jekyll no longer support relative permalinks. You must remove the relative_permalinks configuration option from your GitHub Pages site's _config.yml file and reformat any relative permalinks in your site to absolute permalinks. Find the line that starts with relative_permalinks: and delete the whole line. Search your site's posts or pages for relative permalinks. Replace any relative permalinks with absolute permalinks.